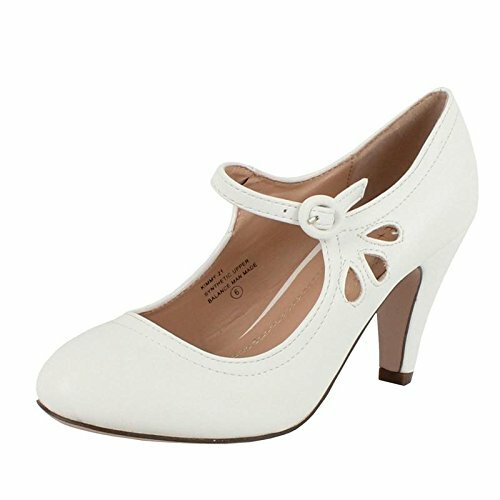 Chase & Chloe has created a fashionable and practical shoe line in the Kimmy-21 Mary Jane style pumps. This classic design has been embellished by a subtle laser-cut design in the side panel. All of our Kimmy-21 shoes are constructed from a durable, long-lasting faux suede and feature a thinly padded insole for your comfort. These shoes also feature an adjustable ankle strap to ensure a well-fitting shoe. Chase & Chloe has created a colorful line of shoe options in the Kimmy-21 style. Browse the available options and find a color to match any outfit. CLASSIC MARY JANE STYLE: This classic shoe style features a faux suede upper embelished with a laser-cut design in the side panel for an added element of interest. ALL-DAY COMFORT: A lightly cushioned footbed and closed toe design helps provide a comfortable experience. Wear these shoes for an assured all-day comfortable experience. ANKLE STRAP: The adjustable ankle strap with side buckle closure helps ensure that these shoes will comfortably fit your feet. FIT: These shoes fit true to size. Please reference the Amazon size chart for assistance in choosing the correct size. If you have any questions about this product by Chase & Chloe, contact us by completing and submitting the form below. If you are looking for a specif part number, please include it with your message.